Shakes, a quake, tremors, earthquake, panic, call it what you wish. Yesterday, on Tuesday, January 12, at 5 minutes to 6 pm, the island once again reminded us that it moves, that it is not a piece of static earth, that its plates are not like those of cars and that the ground does not ask for permission for instantaneous shakes. Haiti's capital, Port-au-Prince located 10 miles east of the earthquake's epicenter, was left devastated and incommunicado. Buildings had collapsed, and left countless thousands injured or dead, as there are no official numbers. Without electricity, water, or communication, several hours passed before the entire world could witness the damage caused by the earthquake. Many of these photographs and testimonies were distributed via social networks such as Twitter and Facebook. The scene was grim, and to make matters worse, the aftershocks did not let up. In the Dominican Republic, as a result of the earthquake, a tsunami alert was placed in effect, and the Emergency Operations Commission (COE) closed the commercial plazas in the capital Santo Domingo and took precautions along the coastal zones and on the Haitian border. In the early morning hours of the next day, Dominican President Leonel Fernández called an emergency meeting to put together a aid commission for Haiti, which included aid for health, water, electricity, infrastructure, and the assistance of the military. From the early morning hours today [Wednesday, January 13] the authorities, businesses, and the Dominican military joined forces to mobilize humanitarian help for the Haiti earthquake. Plane carrying relief supplies to Haiti. Photo by Duarte 101 and used with permission. The Dominican team help send food and bottled water, and sent heavy machinery to help remove the rubble. 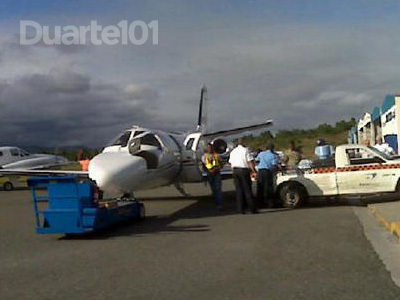 The hospitals in the province of Barahona were made available, as well as the airport to receive aid that would be distributed to Haiti. Personnel from the COE attended to more than 2,000 injured and the Dominican Institute of Telecommunications (Indotel) helped to restore telephony services. The Dominican Red Cross and the International Red Cross have been coordinating health relief services. The Dominican Republic has also been a landing point for foreign correspondents who have come to cover the tragedy. In addition to the efforts of the government, many Dominicans have joined the cause with collection centers, while others have offered private plnes and other materials destine for Haiti. Duarte 101 [es] writes a short summary of the help needed and collection points across the Dominican Republic. The Dominican people have bent over backwards to help Haiti. What happened in Haiti has no precedent. There is too much pain. Too much suffering. The absurd differences stop here and solidarity is imposed, pure and simple, openly and decidedly. This is the right moment to help our brother nation. Let's give our hand and our soul to a people that do not deserve so much suffering. When a natural disaster like an earthquake strikes, as it has done Haiti, causing so much damage, destruction of property, injuries to tens of thousands of people with thousands more perishing in the catastrophe, it is time for us to remember that we are ‘neither masters of our fate all the way, nor are we victims of circumstances all the way’. It is time to remember the sanctity of life, liberty, equality and show compassion, care and extend assistance liberally. This is not just another moralistic preaching, but the need of the hour in this calamity. What happened in Haiti has no precedent. Really. The San Fransisco Fire/earthquake of the early 1900’s. The 2004 earthquake which caused a biblical tsunami that claimed at least a hundred times more innocent lives. What has no precedent is that we get to see how a nation who refuses to take care of itself gets flattened and dies while right next door a stable responsible nation brushes the dust off and just goes to work the next day. Why exactly does my money have to go to help people who have spent the last 25 years tearing themselves apart? All the while a nation next door and possessing the same natural resources and climate prepare themselves for both disaster and prosperity? You reap what you sow. Haiti is now finding out why it’s better to be the ant than the grasshopper. Are you stupid or something You need to seriously take a geography class. The conditions in Haiti are much more different than those in the DR. It is impossible to put the two nations on the same level playing field. The people in Haiti first off are on a major fault line, thus why they are constantly bombarded with disasters, while the DR is not. As well much of the rainfall does not land on the side of the Haitian peole. Also the Haitian soil is nothing compared to that of the DR which was stated to have the most fertile soil around. So next time you want to talk about a country maybe you should do a little research first or better yet maybe live a day in their shoes. This goes to ryan salsa and the others that think they shouldn’t help or donate to help the victims of the earthquake in my lovely country Haiti. Natural disasters don’t choose who and where to stike, just look at history. Haiti was actually developing at a reasonable pace, crime was sharply down down, tourism was on the rise, and despite a global recession, the Haitian economy was rising, rose at a decent 2.5%, things were moving upwards but then the earthquake hit and all the progress was halted, we all have an obligation to help one another as human beings and If you don’t believe that, may karma visit you and yours oneday. It is very good that Dominican Republic, helps Haiti.